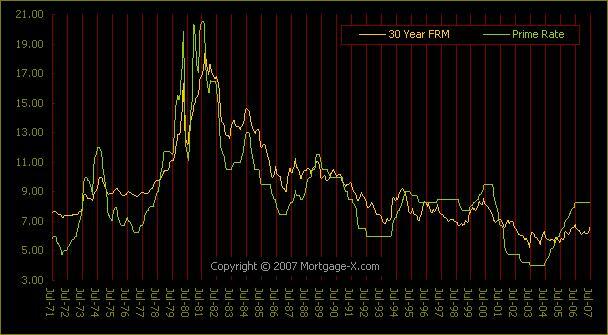 Mortgage rate history has always intrigued me and many others. When it comes to credit cards and home buying we are bombarded with emails, websites, radio and television ads telling ut all about interest rates. Adjustable rate mortgages are the big topic right now as many subprime loans come due. The chart below is provided by Mortgage-X.com. It tracks mortgage rates in yellow and the prime rate in green. It tracks these rates from July of 1971 through July of 2007. Having started my real estate career in 1980 I lived through the highest mortgage rates and prime rates this country has ever seen. It makes me appreciate even more the stable and affordable mortgage rates we have today. It isn’t great for savers but the low rates of today have allowed many the ability to own a home.